This weekend I was talking with some individuals about careers in healthcare. The people that I was talking to are completely out of the healthcare industry. Probably the most surprising aspect that I shared with them was the rampant amount of violence that is in the healthcare environment. Most individuals when they think of healthcare they picture in their mind becoming a medical technician, nurse, physician’s assistant, or a physician. They do not give any thought to the reality of the situation that the provision of American healthcare is a service profession with very overt physical risks. These risks are different than law enforcement or firefighting but are certainly a significant factor in providing healthcare. 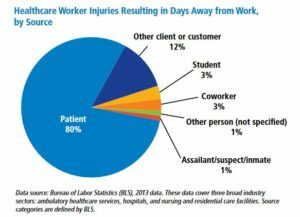 The Occupational Safety and Health Administration tracks violent injuries resulting in days away from work according to each industry. 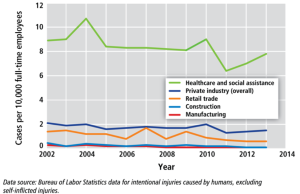 The Bureau of Labor Statistics data followed the professions of healthcare, private industry (overall), retail trade, construction, and manufacturing from 2002 to 2014. This provides an important insight into the level of violence in the healthcare industry. Workplace violence episodes were four times more common in health care than in the private industry on average. In 2013 the healthcare sector accounted for 7.8 cases per 10,000 full-time employees. To put that into perspective other large industries such as construction had fewer than two cases per 10,000 employees. The sources of violence include patients, visitors, and even coworkers. While many individuals may not consider verbal threats to be significant, it can be somewhat nerve-racking to wonder whether or not the individual is serious and intent. By far the largest source of violence in the setting are our patients. 80% of serious attacks were caused by interactions with patients, followed by family members at 12%. Unfortunately, I myself have experienced this type of violence at each level of the healthcare system that I have worked in. Whether that was a kitchen dishwasher, a surgical technologist in the operating room, a registered nurse, or a physician. I have seen it all too often. I have had colleagues which have been murdered, stabbed, shot at, spit on, and their property defaced not to mention screamed at and struck. There are no simple answers as to how we can prevent this type of violence upon our industry. We do however have to begin to speak up. If we are not active in reporting these type of episodes acceptance will become even more commonplace. If we continue to proceed in a codependent fashion, pretending that ignoring the violence is our ethical duty to, “do no harm” we are not helping either ourselves or future patients. Our work is important and necessary. Below please take time to look at some of the websites that are addressing this issue.